The wedding dress. You just know when you’ve found it. You could be at the start of your search or have tried on, what feels like a thousand dresses, but suddenly you try it on. And you just know! And so starts the search for the perfect bridal accessories, to not only complement the exquisite qualities of your dress that you fell in love with, but to draw them out and show them off in all their glory. Each and every bride is drawn to different qualities of their dress, even when wearing the same gown! Therefore the accessories they choose, will also be different. For our bride Kristina, she fell in love with a beautiful free-flowing ivory gown that featured a sheer back and delicate blush beading on its bodice. When she contacted us, she shared her love for the fine beading on her gown. 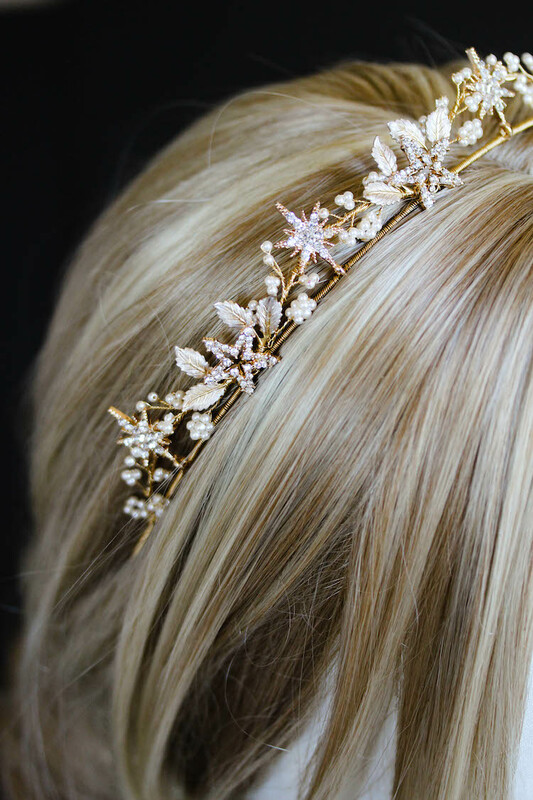 We just knew we needed a hair piece that would draw attention to the delicate blush details, but would also be a stand alone piece. We went with rose gold jewellery wire for a subtle touch of pink. Kristina is wearing her lush, long blonde, thick hair in a romantic updo. She’s going to look amazing on her day. We decided to create three exquisite rose gold bridal hair pins, with vine-like details and crystal notes, to offer her a variety of styling options for her wedding. Worn in a cluster – to the side or centre of an updo – the hair pins create a gorgeous focal point. Worn in a line, or around a bun, the bridal pins with their vines, mimic the look of many popular bridal combs. I also love to style wedding hair pins tucked in among soft, messy curls. They create hints of finery, for the ultimate romantic aura. However you choose to wear your rose gold and crystal hair pins Kristina, it was a pleasure to collaborate with you and we just know you’re going to be the gorgeous centre of attention all day, and evening long! 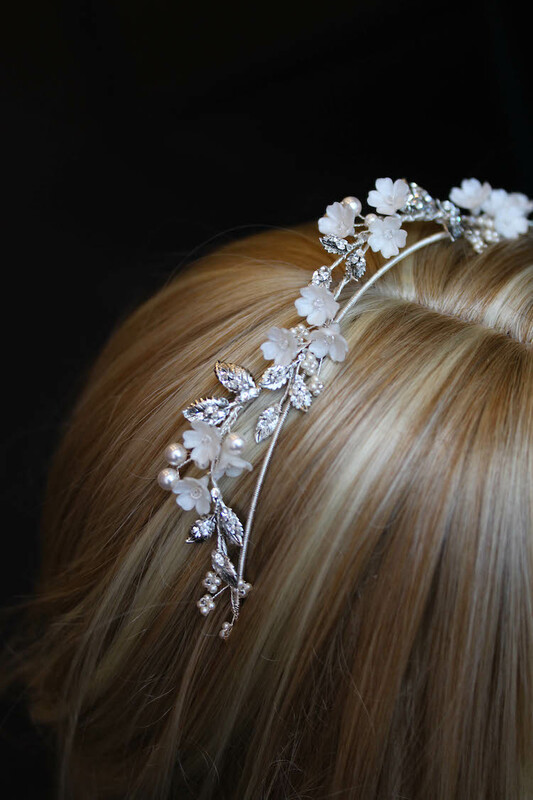 If you would love to create a hair piece that draws attention to the beautiful details of your wedding dress, why not drop me an email?! We’d love to collaborate with you.